To capitalize on the huge success of the Book of Ra slot, Novomatic launched a follow up known as - wait for it - Book of Ra Deluxe. Apart from making it 10 lines instead of 9 and giving it a modern look, there are very few differences between the two games. You will, however, find it at dozens of great casinos online. In terms of symbols, it's pretty similar to the original Book of Ra slot: the 10-through-Ace symbols, scarabs and winged birds are all here but the graphics have undergone a major re-haul. 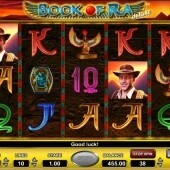 The bonus round in the Book of Ra Deluxe slot is possibly the most rewarding part of the game. 10 free spins at 2x multiplier are triggered by getting 3 or more scatters on any of the 5 reels. You also get an added expanding symbol that creates extra winning combinations when it appears 3 or more times in any one spin. 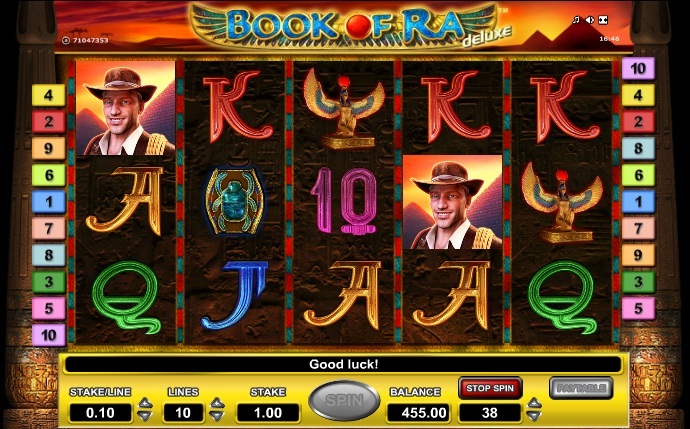 As many will be well aware, Book of Ra Deluxe is a highly volatile slot, just like the original. This means long waits between wins and you may not even make it into the bonus round on occasions. If you are playing with a small bankroll then you should play in smaller stakes as it could go quickly. Fans of classic Egyptian fare should get a kick out of this game. The expanding symbols and free spins are rewarding, if unspectacular, but if you are into your Novomatic slots, make a beeline for the Shogun-themed Katana and magic-themed Fairy Queen.